Getting ready for Valentines day is one of my favorite things to do. I just love the colors and the emotions behind the sentiments. Today I want to share with you a card I made for just this occasion. It is called "Key to my Heart". I found a wonderful flower tutorial on youtube by RoseS915 and had to try it. 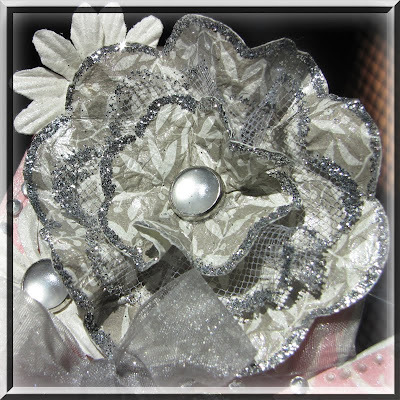 I used Ritzy Ditzy Glitz in Silver to soften the scalloped circle die cuts and to give it some shimmer. 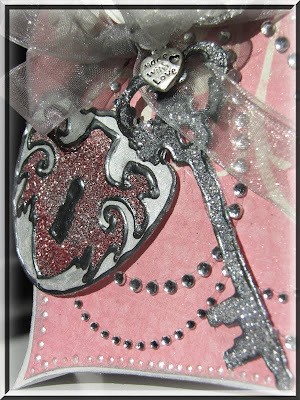 I also used my Quickie Glue Pen and P K Glitter Glitz in Silver to add the glittered edge once it was dry. I threw in a layer of tool spritzed and glittered the same way. I just love this flower!!! 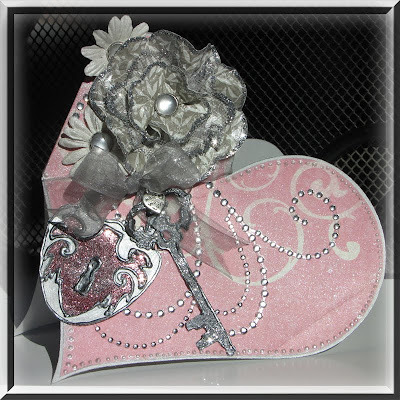 The padlock and key were cut from sticky paper and silver velum then glittered with P K Glitter Glitz in Silver and Tudor Rose. I just love this color combo, don't you? Now to decide who to give it to... hehe. LOVEEEEEeeeeeeee this...the colors are just perfect!!! I so enjoyed the tutorial...I have to try it!!!! Wishing you a great day....thanks so much for sending your thoughts and prayers our way!! !